The exhibition at Sprueth Magers gallery will showcase some of Gursky’s work dating from the late 1980’s to the early 1990’s. Predating before Gursky’s extensive use of digital technology. The images exhibited are an insight into Gursky’s obsession with landscapes and his unique approach to photographing them and turning the seemingly mundane into something other worldly and unnerving. Exhibition ends on 15th June. Click the link below for more info. 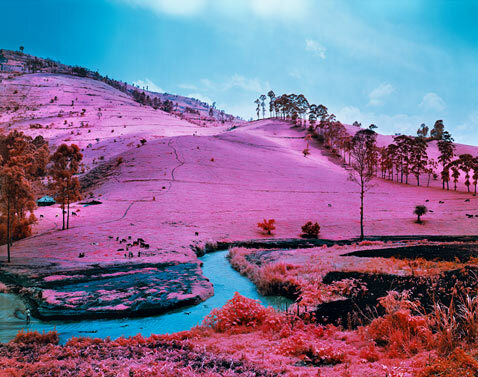 This is Richard Mosse’s debut London solo show. The show consists of video installation work which had been commissioned for the Irish Pavilion at the 55th Venice Biennale. Mosse uses extinct infrared film, once used by the military in order to detect camouflaged installations. Mosse embraces the infrared mediums subtle shift in wave length in an attempt to challenge documentary photography. In her first solo show at Flowers Gallery, Teichmann takes us into a liquid dream like world filled with desires. Tiechmann’s practice uses still and moving image, collage and painting. Esther Teichmann interview for Foam Magazine by Anne-Celine Jaeger. Exhibition ends May 10th. For more info click the link below. On display at the Tate Modern is a selection of works by Harry Callahan. Callahan described his focus within his work to be ‘Nature, Buildings and People.’ The Tate have chosen to separate his work into these three themes. Callahan is one of American’s photographic pioneers. Exhibition ends 30th May. For more info click the link below. This exhibition explores Deakin’s work between 1950’s to early 1960’s and culuture around Soho and drinking. Considered to one of the greatest post-war photographers, the show includes unseen portraits of the artists Lucian Freud, Francis Bacon and writer Dylan Thomas. This is a show not to miss out on.